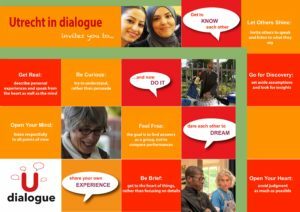 A dialogue is a conversation in which free exchange of thoughts and ideas take place leading to new perspectives and insights. It is a collective way of sensemaking based upon real listening and speaking from your heart. There are four steps in a dialogue and some basic rules to take care of. A dialogue starts with getting to know each other. You give your name and your first associations with the theme and what it means to you. 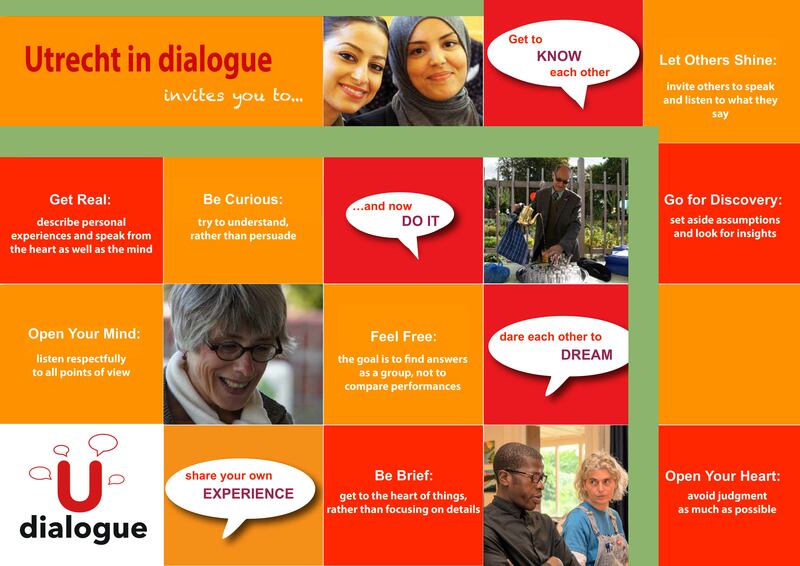 The next step is to discuss the dialogue rules and share where you are good at? You share experiences. Tell about a personal experience you had recently around the theme. Describe visually what happened: where, with whom, what did you see, what did you do? Ask in depth questions so that you get a clear picture of the other’s experience. Furthermore you can expand on the positive associations with the theme. Maybe there is something the experiences have in common? You dream together. What does your desired or ideal future look like in relation to the theme? Can you describe this image. What do you see, hear and feel? Together you brainstorm about what you can do to reach your ideal future. How can you bring your dream closer? What is the first concrete step that you can take? Please put off judgment as long as possible. For a good dialogue, we need to resist some of our natural conversation habits. Like many Dutch women used to wear aprons over their skirts. When they mopped the floors, they had to “suspend their skirts” so they did not get in the way. The same applies for a good dialogue. You need to suspend judgment so it does not get in the way. So you won’t trip over it. Only then you can look beyond your own set views. Speak frankly and in depth without getting long winded. If we make a clear point, interesting differences become visible, and our views become clear. Listen respectfully to all contributed views. All participants in a dialogue are equal and deserve equal respect. Don’t think against the other (“Yes, but…”-attitude). Think with the others and ask clarifying questions. This is about finding answers together and about asking new questions. It is not at all about individual performance. Please make room for new thinking. Go beyond your old thinking, beyond opinions and views. Invite others to tell while you listen. To be in dialogue means you listen with all your attention and appreciation. And that you are willing to share experiences. Take your time. Strive to understand, not to persuade. Listen actively. Put yourself in the other’s place. Look at the world through the other’s eyes. Be open to the other’s story. Let go of presumptions, go for new insights. Don’t try and find solutions. Explore underlying reasons, norms and values. ​​Discover the views behind a problem or solution. Speak from your heart about personal experiences, not just your opinion. Anyone can express their opinions and feelings. You speak for yourself. Openly and honestly.